There's a scene late in Jay Roach's lastest feature "Trumbo", where our title character Dalton Trumbo makes a speech in acceptance of a Lifetime Achievement award at the WGA's annual awards ceremony. In it, he explains how he had often felt like the "elephant in the room" in the film community, due to the controversial political beliefs which provoked much of the drama surrounding his biopic-worthy life. The analogy could easily be applied to the film itself. Largely ignored in general media coverage, it still managed to be a consistent presence throughout this year's awards season. And though the general consensus framed the film as bland Oscar bait engineered for AMPAS love, what I found was a harmless film that certainly wasn't as egregious as the critics would have you believe. "Trumbo" chronicles the life and work of Dalton Trumbo, a talented screenwriter who's career was marred by unfortunate anti-Communist paranoia throughout much of the post-war 1950s. As one of the infamous "Hollywood Ten", he was blacklisted for his association with the Communist Party USA. But despite the aggressive backlash, lead by gossip columnist Hedda Hopper and her House Un-American Activities Committee, he managed to rise above it all, sacrificing his personal life and freedom. Throughout his ordeal, he found a way to keep writing under various aliases, delivering some of cinema's classic screenplays, including Oscar winners "Roman Holiday" and "The Brave One". And of course, the usual triumph over adversity narrative unfolds, with Cranston leading a strong ensemble cast. Those seeking a more inventive style of storytelling will surely be repelled by this by-the-numbers plotting, and with good reason. But on the other hand, it tells an interesting, engaging story and crafts a fascinating central character through Cranston's compellingly self-aware performance. His Trumbo is as self-involved as so many other "great, but flawed" men we've seen on screen, but he has his own nonchalant sense of humor that sets him apart. Would I nominate him for an Oscar? Perhaps not. But it's more than capable acting considering the constraints of playing a real-life character. In casting the other roles, the film has a few other standouts, notably Michael Stuhlbarg as the conflicted Edward G. Robinson. And it's understandable why Helen Mirren gained plaudits for her showy performance as Hedda Hopper, a real "piece of work" as they say. Most importantly, the cast deserves credit for avoiding mimicry, which could have easily cheapened the film (hey "Hitchcock"!) given some of the more dubious casting choices. 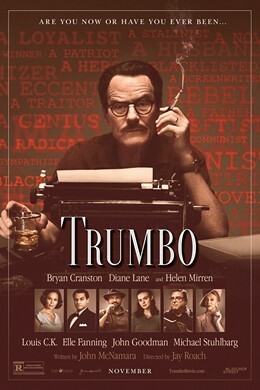 In summary, "Trumbo" doesn't do anything outstanding, but it's tastefully made and pleasantly entertaining. Sure, it could have taken a bit more risks, but I found more to like than not. And in a week of underwhelming films, that was good enough for me.